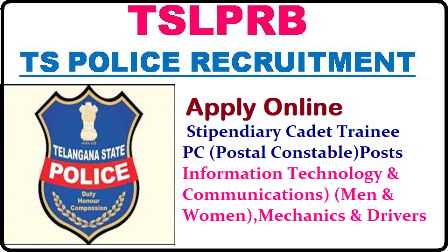 TSLPRB Police Constable Recruitment 2018 – Apply 231 Stipendiary Cadet Trainee PC Posts: TSLPRB SCT Constable IT Recruitment 2018. TSLPRB SCT Constable Driver Recruitment 2018. TSLPRB Constable Mechanics Recruitment 2018. The Telangana State Level Police Recruitment Board has released a notification for the recruitment of 231 Stipendiary Cadet Trainee PC Posts. TS Police invites the applications from the eligible candidates to fill Constable vacancies in Police Department & in Police Transport Organisation. Candidates can apply from 09th June 2018 to 30th June 2018. Other details like age limit, vacancy details, educational qualification, application fee, how to apply, selection process, important dates for TSLPRB Police Constable Recruitment 2018 given below. recognized by the State Government as being equivalent to SSC. For TSLPRB Police Constable Recruitment 2018, Candidate age limit should be between 18 years to 22 years and 21 – 25 years. TSLPRB offers a pay scale to its employees according to the TSLPRB Police Constable Notification 2018 is given below. Candidate should have to pay the application fee as per the official TSLPRB Police Constable Jobs 2018.